The poems in Thomas Stewart’s debut pamphlet Empire of Dirt share the enchanted forest feel of the darkest fairytales. Nature appears on these pages as something elemental and vaguely sordid, with humans only one footfall away from entering the shadowy, loam-scented spaces on the fringes of suburban streets. Moving, enticing and richly redolent, these poems summon the paradoxical sense of peace laced with disquiet that’s so particular to woodlands, where the unseen creeps ever closer. Many of the poems are about observing. In And then The Flowers Came, he writes: “outside/ the trees can/ smell me, their/ roots/ brew plots,/ they’re watching/ me, with/ everyone else”. In Skull, Stewart invites us to become the voyeurs, ogling the intimate miracle of Adam birthing his Eve. More contemporary suspicions come into play with the awareness of a neighbour spying from between the petals of a hibiscus across the road: “she watches/ how many cigarettes/ I smoke/ or how many times/ I check Grindr/ on my phone.” The tension between timeless and modern, and between threat and temptation, is palpable. Elsewhere in the pamphlet, the fragrance of smashed conkers is linked to memories of teen suicides, and a murdered bird brings a miscarriage to mind. Other poems wade deeper into the realm of folklore, as in the wistful There Are Bees in My Beard. This uncommon theme is continued in the title poem, where we’re warned against the colour yellow for fear of attracting bees, and invited to walk barefoot with our poet guide through a forest to a cave “where I can scrawl my dreams/ in blood and the sap of a tree”. The imagery is shamanic and ancient, yet to reach it we need to leave a house with a mirror on the wall, crossing thresholds both figuratively and metaphorically. Throughout Empire, there is a sense of yearning – of wishing to learn big truths, whether from moths, from clouds or from the world beyond the window. Stewart writes of rain holding onto “anything that would listen,/ it absorbed the green cotton/ of my cardigan.” A delicate lilt to Stewart’s phrasing suggests he understands that craving to embrace anyone and anything willing to listen for a few moments. 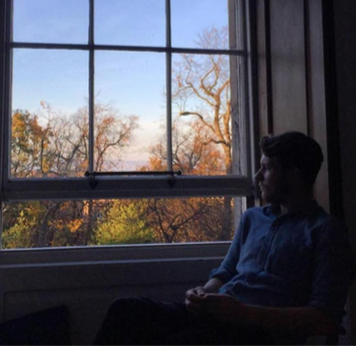 Stewart’s poetry offers up confessions to feeling lost and seeking a way into this world, when the honest truth may be a desire to be able to look himself in the eye and regard himself as he truly is. Perhaps in that case, in those terms, these are poems about seeking acceptance, less from nosy neighbours and the wilderness beyond, but from oneself, from the depths of a cold cave within the tangled woodland of the soul. 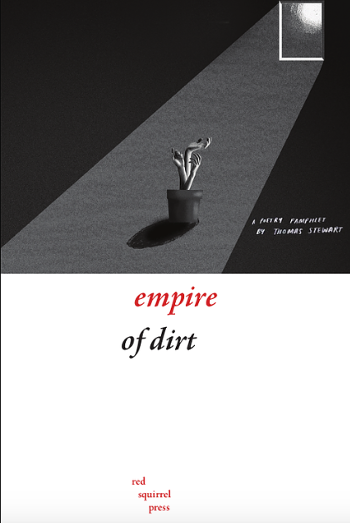 Empire of Dirt by Thomas Stewart is published by Red Squirrel Press. This entry was posted in Reviews and tagged Empire of Dirt, poetry reviews, Thomas Stewart by Judy. Bookmark the permalink.